Heat vegetable oil in a large skillet over medium heat. Sprinkle chicken breasts with salt and pepper, and place in hot oil; cook for 5 minutes, turning to brown evenly. Remove skillet from heat. Roll out pastry shells as thinly as possible so that it is big enough to fit around a chicken breast. 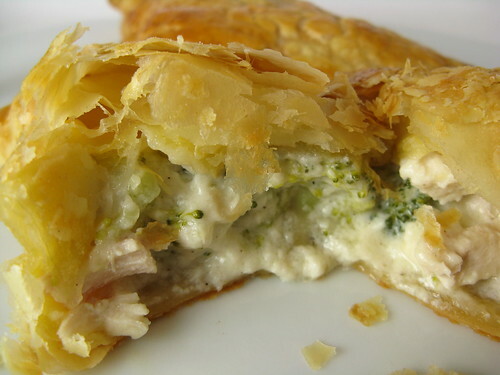 Spread 2 ounces of cream cheese on one chicken breast, place in the center of a pastry sheet; fold the pastry around the chicken, and pinch the pastry edges together very tightly to seal. Repeat with remaining ingredients. Place the pastry-wrapped chicken breasts on a greased baking sheet. Bake for 12 to 15 minutes, until golden brown. No comments for: "Nancy's Chicken in Puff Pastry Recipe"